The following article originally appeared in the Wisconsin Journal of Family Law and was co-authored by Judith Hartig-Osanka, a family law attorney with the Racine law firm of Hartig, Bjelajac, Cabranes & Koenen. She is a member of the Board of Directors of the Family Law Section of the State Bar of Wisconsin. In 1992, Georgette Kerkvliet was allowed to move to Florida with her four children. Left behind was her former husband and the father of the children, Jim Kerkvliet 1 The effect of the removal was to destroy the relationship of the children, not only with their parents, but since two of the children ended up staying in Wisconsin, with their siblings, as well. At the same time, certain issues had arisen regarding technical aspects of the removal statute then in effect. For example, the notice of intent to remove did not require specificity regarding time and place of the intended removal. More important, if the non-moving parent filed an objection to the intended removal, but did not file a motion to change custody, the other parent was essentially “frozen”. No legal recourse was available in the statutes allowing the moving parent to initiate a court action or to move following the objection. Partly in reaction to these technical problems and partly in response to the court of appeals decision in Kerkvliet v. Kerkvliet, 166 Wis. 2d 930, 480 N.W. 2d 823 (Ct. App. 1992) 2 , the legislature amended the removal statute in an effort to remedy these concerns.3 The purpose of this article is to discuss the evolvement of removal legislation both before and after Kerkvliet and to discuss certain issues which have arisen under the current state of removal law in Wisconsin. Contemporary history of the removal issue begins with the enactment of Sec. 767.245(b), Stats. 1983-84. Under that statute, the court could deny permission to move upon a finding that the proposed move was against the best interests of the child. [A] finding under Sec. 767.245(6), Stats. 1983-84, that an out-of-state move will be against the child’s best interests requires a finding that removal and alternative visitation arrangements will significantly harm or impede the child’s relationship with the noncustodial parent and that this harm to the relationship will work to the child’s detriment. The legislature took the next step with the passage of 1987 Wis Act 355, which created Wis. Stat. §767.327, which included moving more than one hundred fifty (150) miles from the other parent as a removal. One commentator found that the new statute basically codified the holding in Long:8 Section 767.327, like the decision in Long, actually compels an examination of the nature of the child’s relationship with the non-moving parent, how that relationship may be changed as a result of the proposed move, and what alternative “visitation” arrangements are available to foster the child’s continued relationship with the non-moving parent. Arguably, because the court must assess whether the purpose of the proposed move is reasonable, the mandate in Long has been expanded slightly. The next development was the court of appeals decision in Kerkvliet. Seven years after the divorce, Mrs. Kerkvliet wanted to move to Florida with four children because of the weather. She had been a good parent and Mr. Kerkvliet had been a very involved, non-custodial parent. The trial court, Racine County Circuit Court Judge Stephen A. Simanek stated that the move was “inappropriate”, “wrong”, “disruptive”, and “selfish”, but concluded that there was no legal basis to transfer custody to Mr. Kerkvliet. Therefore, the statute did not allow the court to deny Mrs. Kerkvliet the right to move. The court of appeals affirmed. Based upon the court of appeals ruling in Kerkvliet, the State Bar of Wisconsin Family Law Section worked to get Wis Stat. §767.327 amended. The purpose of the amendment was, in part, to fix the technical problems with the statute, but also to remedy the problem that the trial court acknowledged in Kerkvliet: To give the trial court discretion to prohibit a move where the reason for the move is found to be unreasonable. The language added by 1995 Wis Act 70 created an alternative remedy to transferring custody by allowing a motion for the removal to be denied. The same act also created a rebuttable presumption in favor of continuing the current allocation of decision making and placement with the parent with primary placement. This presumption may be overcome by a showing that the move is unreasonable and not in the best interests of the child. By the very nature of removal cases, the controversy over the state of the law will never go away. Where there are two involved parents and a necessary move by one of the parents, both sides are “right” and neither side is “wrong”. Yet, one side has to lose, frequently with catastrophic results to the “losing” party’s relationship with the child. Unlike placement disputes over a few days or nights here or there, relocation cases play for huge stakes. Indeed, when the American Academy of Matrimonial Lawyers drafted a model relocation law 9 they could not reach consensus on the critical issue of burden of proof. Since the 1995 act which amended the removal statute, questions have arisen from time to time. Q: Does the amendment change the subsequent law, to make Wisconsin a restrictive removal state? We have become aware of some cases where either GALs or courts have interpreted the amendment as an attempt to make Wisconsin a more restrictive removal state. That was not the intent. Other than procedural changes, the 1995 legislation was intended to restrict moves only where, similar to Kerkvliet, the reason for the move was unreasonable and unnecessary. This is not to say that removal is good for children 11 On the other hand, neither is removing the child from a primary, nurturing parent. The “liberal removal” policy of Wisconsin assumes that the child can adjust more easily to a new environment than adjust to a new primary parent. Certainly, this is a determination which must be made on a case-to-case basis. However, insofar as the law gives guidance to the courts, this assumption remains intact in Wisconsin. Q: Does Wis. Stats. §767.327 apply prejudgment or only post-judgment? Wis. Stat. §767.327 is intended as a post-judgment statute. After all, there cannot be a “primary placement” parent until the divorce is final. For prejudgment cases, Wis. Stat. §767.08(1)(c) applies. Under that statute, removal is prohibited after the commencement of a family action. However, a parent can ask for a temporary order under Wis. Stat. §767(1)(b) allowing a removal during the pendency of the action. Q: Does Wis. Stat. §767.327 also apply to paternity cases? 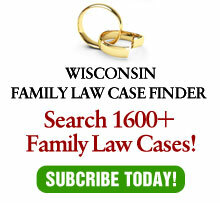 In listing the statutes which apply to paternity, Wis. Stat. §767.51(6) omits any mention of Wis. Stat. §767.327. This omission is not accidental. When the 1995 amendment was being drafted, adding removal to §767. 51(6) was included in the initial drafts. It was removed, however, prior to the final draft. This decision was not without a debate. Those in favor of inclusion argued that removal statutes were designed with the best interests of the child as the primary objective. Children of parents who never married are entitled to the same protections as those who did marry. Further, the argument went, such a distinction may violate constitutional guarantees of Equal Protection of the Laws. The other side of the issue argued that inclusion of paternity would be confusing and unnecessary. Many paternity mothers are relatively unsophisticated, whereas many of the respondents have little interest in their children. For those men seriously interested in their relationship with the child, the general modification statute, Wis. Stat. §767.325, provides ample opportunity to contest a move. For a variety of reasons, some philosophical and some political, the statute continues to expressly exempt paternity cases from inclusion under Wis. Stat. §767.327. Q: What is the interplay between Wis. Stats.§767.325 and §767.327? Removal law has been gradually changing over the years, in an continuing effort to balance the rights of one parent to move and the other parent to have a continuing relationship with the children. In removal law, the irresistible force often meets the immovable object. The law is incapable of resolving these issues fairly to both parties, so it continues to struggle for an appropriate balance and guidance for courts. Sometimes the best which the law can do is allow the courts to consider the peculiar facts of each individual case and make an appropriate decision accordingly. 1 – One of the authors of this article, Attorney Judith Hartig-Osanka, represented Mr. Kerkvliet both at trial and on appeal. 3 – The authors of this article were extensively involved in this legislation by drafting language, lobbying legislatures and testifying before legislative committees. 5 – Ibid. at 530. 8 – Patricia L. Grove, “Moving the Residence of a Minor Child: The Impact of Wisconsin Statute 767.327”, The Milwaukee Lawyer, Vol. 11, No. 3, 1989. 9 – The Burden of Proof disagreement is documented in the comment to §407. Gregg Herman was a member of the Special Concerns of Children Committee which drafted the Model Act. 11 – For the point of view of a child, see: Nick Sheff, “My Long Distance Life“, Newsweek, February 15, 1999.